At ProWellness Chiropractic and Rehab, we help all ages of people return to doing the things they love in life. With chiropractic and physical therapy available, we create individualized plans that help you reach your goals. Find out what we can do for you! 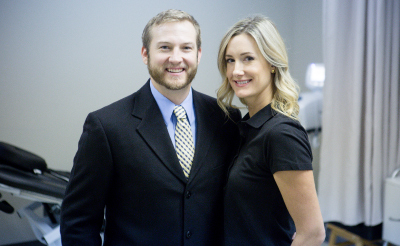 Cold Spring Chiropractor Dr. Mark Johnson and his wife, Physical Therapist Jessica Johnson, work as a team dedicated to improving your quality of life. Whether you receive Chiropractic, Physical Therapy, or a combination of both services you will make improvements that will last a lifetime. You will be provided with personalized care that will address your source of pain so you can perform activities, at your ability, without pain. Simple activities such as getting out of bed in the morning, standing up from a chair, putting on your shoes or just getting a good night of sleep may not be so simple when pain is present. Or you may be concerned with your ability to complete an activity more complex such as crossfit, running, biking, yoga or dancing. As a patient at ProWellness Chiropractic and Rehab, you will gain from our expertise a greater understanding of why you have pain and how to overcome it. No complaint is too big or too small. Have you ever thought the following? I had constant foot and hip pain causing difficulty walking and standing. I have gone from being in pain 80-90% of the time to little or no pain at all!I walk and stand correctly now after treatment and rest much better at night. I had a sharp shooting pain through my neck, jaw, ear, temple and eye. Within several weeks of chiropractic care all my symptoms were gone. I feel better, I’m in a better mood, and able to move with more ease! Chiropractic care has also alleviated almost all of my fibromyalgia pain. I started seeing Dr. Johnson at the beginning of my pregnancy. I had some hip and rib pain. I have responded very well to his treatments. Dr. Johnson has helped make my pregnancy more comfortable. I love how he keeps my pelvis in line to better support the baby. My condition has greatly improved and my migraines have gone away completely. I went from having multiple seizures a week to being seizure free for 5 months. I had severe wrist pain and was diagnosed with carpal tunnel syndrome in both hands. I was ready to schedule surgery. After chiropractic care, almost all of my pain is gone and my strength is returning.